To divide into three parts or sections: Branching off or parting into three directions: While following the map, Bernice could see that the freeway trifurcated in about three miles, but she knew she needed to stay in the middle lane because she did not want to travel in the right or the left lanes. 1. To make a set of three identical objects or copies of something: Monica was told to triplicate the financial reports of the company when she prepared them for the Chief Executive Officer. 2. To make threefold by tripling something: Jill explained to the salesperson that she wanted to triplicate the items she was buying because she wanted to share them with her friends Leslie, Tina, and Mia. 3. 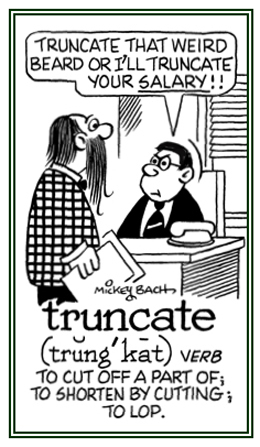 Etymology: from Latin tripicare, "to triple". Something that has three precise parts to it or which exist in three exact reproductions: When Tim went to the photo shop to have his travel pictures developed, he wanted to have them printed in triplicate so he could place one set in his album and share two copies with his friends Erin and Patrick. Descriptive of anything that has three explicit sections to it or which exist in three word-for-word presentations: Matt instructed his secretary to send triplicate invoices to the contractors who were working on the project. 1. To shorten something by cutting off or removing a part or to make shorter: A malformation or birth defect can truncate an arm or even a leg. 2. To decrease a presentation by making it briefer; especially, by removing the end of it: Television coverage of the soccer match was truncated by a technical fault. 3. To restrict the precision of a decimal number by limiting or dropping the digits to the right of the decimal point without rounding them: The numbers 1.4262 and 1.4887 can both be truncated to 1.4 by not rounding them off. 4. 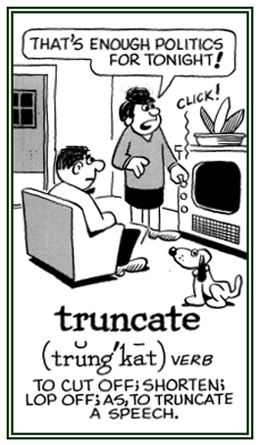 Etymology: from Latin truncare, "to cut short, to mutilate". © ALL rights are reserved. To change from wearing pants, trousers, or slacks to wearing outfits or apparel consisting of robes, gowns, skirts, or even dresses: After he moved to a hot country, Jamie decided to unbifurcate his wardrobe to more comfortable Scottish kilts which were cooler to wear in the extreme heat. Kilts, skirt-like garments, usually worn by men in the Scottish Highlands. Cassocks, long, robe-like clothing worn by members of the Catholic clergy. Fustanellas, short pleated skirts of white cloth worn by men in Greece and Albania. Hakamas, Japanese outer attire, worn by men and women, both of which have pleated, skirt-like appearances. Kimonos, loose, wide-sleeved robes, fastened at the waist with a wide sash, worn by men and women in Japan. Thobes, loose, long-sleeved, ankle-length wearing apparel for men, worn in Saudi Arabia, Kuwait, and other countries in that geographical area. "Examples of the many unbifurcated garments worn by men around the world." 1. To solve or to straighten out a mixed up situation with a simple solution: The students in class were all very loud so, to uncomplicate this problem, the teacher told them to get their books open to a short story and to answer questions about the contents and hand the results of their work to her before the period ended! 1. To give up possession or occupancy of: George's business must vacate the offices by next month. Jerry and Doris will have to vacate their apartment when their lease expires. 2. To give up or to relinquish, to leave a position, an office, etc. : Because Jim was going to be on a sabbatical leave for a year, he vacated his position at the office. 3. To render inoperative; to deprive of validity; to make legally void: Jack was proven to be innocent of the criminal charges and so his pending sentence was vacated. 1. To irritate by a squeeze between the thumb and finger, to pinch, or to cause a twitch: After correcting so many student papers, Mrs. Black’s eye muscles were vellicating so much that she had to put down her pen and take a break! 2. To touch a part of the body lightly in order to excite the surface nerves and to cause uneasiness, laughter, or involuntary muscular jerks and contractions: Fred liked to vellicate his baby brother on the soles of his feet because it made tiny Tim giggle a lot! 3. Etymology: from Latin vellicatus, past participle of vellicare and vellere, "to pluck, to pull, to twitch", which is of uncertain origin. To cause or to be affected by blisters: Allen's skin was vesicated because he was in the sun too long and then it became red and started to hurt him very much. To disturb, to distress, to pester, to irk, or to provoke: Ted told his wife that nothing vexicates him more than her constant criticism that he doesn't make enough money. 1. To clear someone or something of blame, guilt, suspicion, or doubt: The confession of the real criminal immediately vindicated Jasper who the police had held for questioning about the break-in of the local jewelry store. 2. To show that someone or something is justified or correct: Marilyn checked with a dictionary resource to vindicate the unusual spelling of a word in her essay. 3. 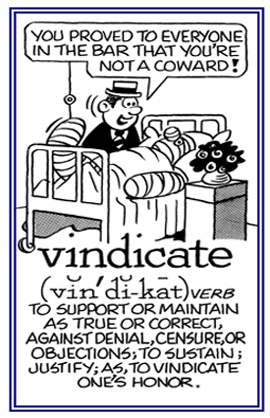 To clear from censure, criticism, suspicion, or doubt, by means of demonstration; to justify or uphold by evidence or argument: The new evidence that was presented in the criminal trial immediately vindicated the defense lawyer's position that her client was innocent. 4. To assert, to maintain, to make good, by means of action; especially, in one's own interest; to defend against encroachment or interference: The doctor's prognosis of the severity of the patient's illness was vindicated by a specialist. 5. Etymology: back formation from vim dictam accusative form of vis dicta, literally "announced force"; that is, "announcement of force". From "to avenge" or "to revenge", from Latin vindicatus, the past participle form of vindicare, "to set free, to lay claim to, to assert, to avenge" which came from vim, accusative of vis, "force" + the root of dicere, "to say". To convert into glass; to vitrify. 1. To renew life; to reanimate; to revive: Right after the accident, Tom’s heart stopped beating, but the paramedic arrived in time and was able to immediately vivificate him. 2. Etymology: from Latin vivificare, "to make alive, to give life to, to restore to life".